Like many NBA bloggers, I’ve been scouring the interweb-o-sphere for any and all minutia relating to this 2011 draft class that, while it began heralded as the most underwhelming draft in years, seems to have a better grip on the attention spans of the NBA obsessed than many recent drafts. In this draft, the big men from Europe are better than the guy from Morehead State who ruined your NCAA bracket and the guy from Oakland who gave your small college sneaker picks credibility on your favorite tournament blog. In this draft, the guy who ran the table at the NCAA’s earned more suspicion than upside. In this draft, a No. 10 pick is just as good as a No. 15, and the player who drops to No. 10 just may be the last player a team would want to draft. In this draft, trust no GM. That’s why today, upon a visit to the Bucks official site, I wasn’t surprised in the least bit to see three players prominently featured as possible Bucks draft picks: Shooting guard Alec Burks, U. of Texas forward Tristan Thompson and Kansas forward Marcus Morris. The usual suspects. All three vaguely fit Bucks GM John Hammond‘s “best player available” rhetoric. They’re all from the competitive Big 12, all from big, recognizable state schools, all safe, sound reasonable possibilities familiar to NCAA hoops fans. And they all shot poorly enough in college to have “upside” as basketball players. The chances are that the Bucks, although they interviewed all three players at last week’s draft combine, don’t want any of the above. That was Hammond the good. Sneaky? Hammond’s pretty good at sneaky in the draft. Last season the players the Bucks had worked out were gone by the team’s No. 37 pick in the 2nd round, so Hammond took Kentucky shooting guard Jodie Meeks, a player he knew the Philadelphia 76ers were interested in. Mid-season, he traded Meeks to Philly for … well, for nothing basically, but that’s another blog and it’s important to remember that being sneaky is all about being sneaky, not necessarily about being effective. 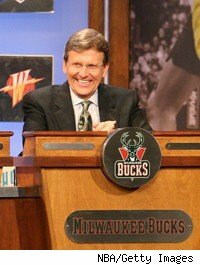 So what’s to gain for the Bucks in advertising interest in three players they may not necessarily want? To trade them or the pick, of course, which is precisely what Hammond should do. It’s in the Bucks best interest to swap one or both of their picks (Nos. 10 and 40), plus a roster mistake (Dooling, Gooden) for the rights to draft a bit lower in the 1st round. Because in the 2011 NBA draft, there’s no such thing as good or bad. And sneaky, this time, is more akin to shrewd. Despite a lot of negative feelings about the “no competitive matchups” format of the combine, there’s plenty of fodder flying around. ***Turkish 7-footer Enes Kanter, the projected top eight pick who hasn’t played in a year (NCAA ban prevented him from playing at Kentucky) wasn’t as impressive to some as Russian-by-way-of-USC center Nikola Vucevic, the biggest player at the combine (7-0, 260, with a 7-5 wingspan. Kanter skipped out on scheduled interviews with the Bucks (wonder what Ilyasova might’ve told him? ), Jazz and Raptors, apparently part of an effort to ensure that the Wizards draft him. Does up-and-coming center Javale McGee, who made more defensive plays per game last season than anybody not named Dwight Howard or Andrew Bogut, know about Kanter’s plans? ***Jonas Valanciunas is still considered the best big man on the board, according to Euro-scouts. The 6-11 Lithuanian has a 7-6 wing span and led Euroleague play in rebounds per minute. Valanciunas ain’t cheap, though. The team that drafts him will have to immediately buy him out of his contract with Belarus Rivas. Trading down and selecting Brooks or Klay Thompson or centers Vucevic or Keith Benson (Oakland) might be the Bucks best bet to improve, if they can move a Gooden and/or Dooling in the process. This entry was posted in NBA Draft, The Jinx and tagged 2011 NBA Draft, Alec Burks, Drew Gooden, Enes Kanter, Jodie Meeks, John Hammond, Keyon Dooling, Marcus Morris, Marshon Brooks, Nikola Vucevic, Tristan Thompson on May 23, 2011 by J.D. Mo.